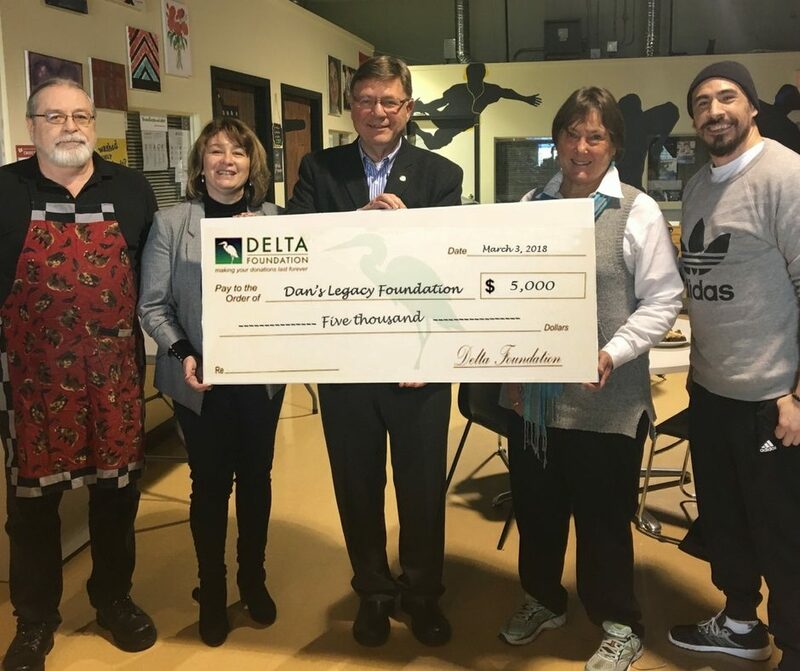 On Saturday, March 3, representatives from the Delta Foundation presented a cheque for $5,000 to Dan’s Legacy in support of the charity’s Supported Program for Youth with Fetal Alcohol Spectrum Disorder (FASD) pilot program. The pilot program is a collaboration between Dan’s Legacy and the Asante Centre, and wraps up at the end of April. Plans are in the works to continue the workshops in the Fall. If you or someone you know is interested in taking part, please contact Tom Littlewood (Program Director) at 604-999-9136 or Barbara Coates (Executive Director) at 604-329-9186, or barb@danslegacy.com. Pictured in the photo are (L-R): Tom Littlewood (Program Director, Dan’s Legacy), Barbara Coates (Executive Director, Dan’s Legacy), Peter Roaf (Director, Delta Foundation), Carlene Lewell (Director, Delta Foundation), Myles Himmelreich (Program Mentor), .